With its iconic sign, banana leaf wallpaper, grand entrance and storied bungalows, The Beverly Hills Hotel is a world famous L.A. institution and probably one of this town's most well known, recognizable buildings. But it wasn't until Tuesday that the 100-year-old hotel earned a formal status as such when the Beverly Hills City Council voted to designate it as the city's first historic landmark. The Pink Palace has been celebrating its big centennial with events and specials for the last few months, including a Friday pool party series happening this evening, so such an honor comes at a perfect time for the legendary hotel. We too have a deep affection for BHH, especially the Polo Lounge and Fountain Coffee Room with their old school charm, so to help celebrate the signature pink and green, we've rounded up some interesting information and historical facts we were surprised to learn about the hotel for you here. 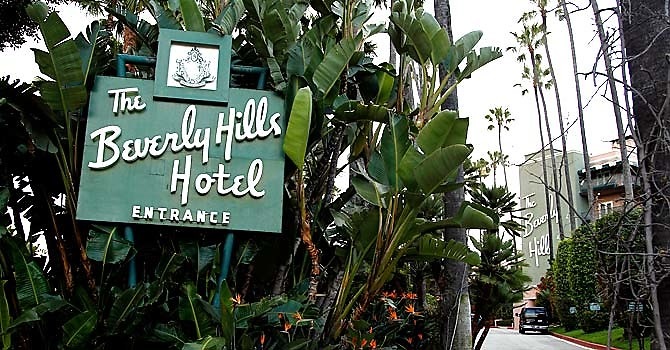 From the unusual living arrangements and accommodations of its celebrity residents to its once very popular man-made beach, here are nine things you probably didn't know about the Beverly Hills Hotel.